FLIR Systems, announced today FLIR United VMS 8.0, the latest version of the company's flagship video management solution (VMS), and three high-performance security cameras, including the FLIR PT-Series HD (High-Definition) thermal and visible camera system, the FLIR Quasar 4K fixed box camera, and the FLIR Ariel 3MP (3-megapixel) corner camera. All three cameras integrate with FLIR United VMS 8.0 and expand the company's end-to-end line of security solutions. FLIR United VMS 8.0 is a comprehensive, enterprise-level video management solution for managing video security operations. FLIR United VMS 8.0 manages large and multi-location video operations, and includes FLIR Latitude software, as well as FLIR Horizon and FLIR Meridian network video recorders. FLIR United VMS 8.0 delivers a more secure system through stronger online security credential requirements. A simplified system installation process and streamlined camera discovery make integration with FLIR products easy. Also, FLIR United VMS 8.0's open platform design allows for integration with third party technologies and is customizable and scalable for any size deployment, from small retailers to large enterprises to critical infrastructure. 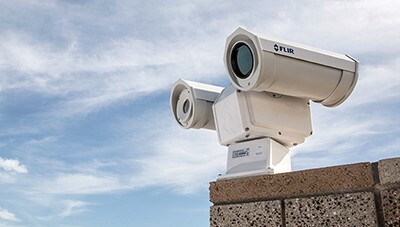 The FLIR PT-Series HD is a dual-sensor camera system that provides superior, long-range perimeter intrusion detection regardless of lighting and environmental conditions. The high-speed, pan-tilt camera provides quick and accurate threat verification. The FLIR PT-Series HD offers either a cooled or uncooled 640x480 resolution thermal camera with a 1080p HD visible camera. Multiple high-performance thermal lenses are available, including optical zoom lenses up to 14X. The HD visible camera also features a 30X optical zoom lens with autofocus and low light capabilities. The FLIR PT-Series HD integrates with FLIR United VMS 8.0 and other major VMS software providers. The FLIR Quasar 4K fixed box multiple-resolution camera can be programmed to switch from 4K daytime mode to 1080p lowlight-nighttime mode to provide optimum, continuous performance. Its compact design allows for the use of specialized camera housings, ranging from explosion to extreme weatherproof, and can accommodate a range of lenses from super-wide to telephoto. The Quasar 4K fixed box is ideal for high-traffic areas, such as large venues and transportation hubs. The FLIR Ariel 3MP corner camera features a 3-megapixel visible camera that provides ceiling-to-floor and wall-to-wall viewing. The corner camera also includes a built-in microphone for audio monitoring and discrete night vision illumination for monitoring low light to totally dark locations. FLIR Ariel 3MP also features an impact-resistant, vandal-proof, flush-mount housing, making it ideal for locations such as medical facilities and prisons where the safety of at-risk occupants is essential. "The latest FLIR United VMS offering provides a flexible, end-to-end security management solution that allows customers to easily scale to their security needs," said FLIR President and CEO, Andy Teich. "With the addition of several new high-performance security cameras, including the FLIR PT-Series HD system ideal for perimeter security, FLIR expands its broad security product offerings and further advances our presence in enterprise security."